Infographic Trends 2015: What are the latest trends in Infogrpahics? There’s been a lot of debate in the past few years about whether we’re hearing the death knells of the infographic… but the fact that we’re even having this debate is an indication that infographics are still alive and kicking. 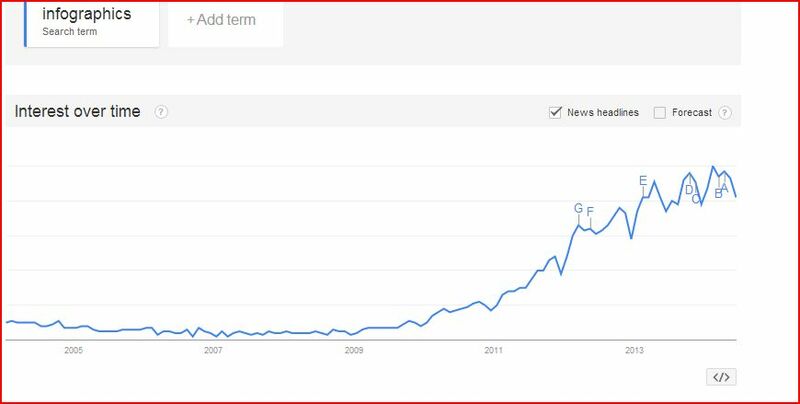 If you have any doubt about the infographic’s continuing prominence, just look at this graph from Google Trends, which tracks how frequently the word “infographics” appears in online headlines. Because Google Trends requires you to scroll over the data points to see the x-value, I’ll walk you through what you’re seeing in this picture. While there were only about 2-10 headlines mentioning infographics in the mid-to-late-aughts, the number of mentions began dramatically increasing around 2009, and in the first half of 2014, there have been between 82-100 mentions per month. And keep in mind those are just the posts with the word “infographics” in the headline—there are plenty of blog posts and news articles that contain infographics without directly referencing them in the title. Of course, one of the primary reasons some people argue infographics have lost their shine is because there’s an oversaturation of this type of online content. Everyone from personal injury lawyers to furniture manufacturers has begun rolling out infographics in an effort to promote online sharing and boost their SEO rankings. With the millions of infographics already on the web, some marketers are asking if there’s anywhere new to go with the form. The good news is that it looks like the infographic is going to continue evolving to reflect our technological capabilities and our audiences’ interests. 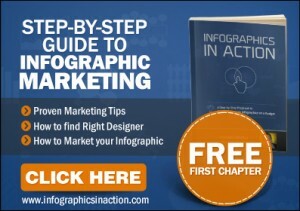 Here are 4 growing infographic trends to watch for. Humor sites like The Onion and Cheezburger have been using infographics to make jokes for years, but the idea of humor in infographics is going more and more mainstream, thanks to social media marketing. Funny infographics are considered “sticky” because they’re highly likely to be shared on social media platforms, sometimes even transforming into viral memes, giving the infographics’ creator a larger audience and a bump up in the search engine rankings. Humorous infographics may not be appropriate for every industry or topic, but in some cases, using an infographic to make wry observations may be one of the best paths to making an impression. Interactive infographics are becoming an increasingly popular tool, and in general, they hold a web user’s attention longer and get more shares than a static infographic. Interactive infographics are particularly useful for conveying a lot of information without overcrowding the screen. For example, this clever water usage infographic lets web users scroll through different parts of their day (starting their morning, eating breakfast, commuting to work, etc.) to see how much water they’ve consumed by the end of an average day. Not only does this infographic allow web users to participate in a “walk through” of their day, it breaks a lot of information up into manageable chunks. Apple sold its 170 millionth iPad last October and its 500 millionth iPhone back in March of this year, so marketers who fail to optimize their interactive infographics for these devices are potentially missing out on a large swath of their target customers. Since Apple doesn’t seem to be making any moves to make their devices Flash compatible, developers are working to create complex interactive infographics using HTML and HTML5. Every day, 100 million Internet users watch at least one online video, so it’s no surprise that infographics are becoming animated. These motion graphics, like this visually attractive video on the rise of craft breweries, typically combine data visualization and kinetic text to convey their message to the viewer. Sometimes a narrator will walk the viewer through what they’re seeing, but in other cases, the text and graphics are enough to convey the message clearly. Motion graphics pack a huge visual punch and are particularly useful in depicting processes or timelines because they direct the viewer to follow the chronology the infographic creator intended. As with the other types of infographics discussed above, motion graphics are highly shareable and are becoming key tools to promote branded messages. What Does the Future of Infographics Look Like? Technology moves quickly, and we’ll no doubt see the current trends in infographics evolve and change over the course of the next several years. One thing is certain, though: while the format may change, it’s unlikely that infographics will ever completely vanish. Keep tracking the trends, and your business will continue to get infographic shares in the years to come.